This Sunday marks the first since mid-July when there won't be a new episode of Game of Thrones, which has been a hard pill to swallow for some fans, especially since there's talk that Game of Thrones Season 8 may not arrive until late 2018 or even early 2019. To help fill that GoT hole in your heart, a mysterious new trailer surfaced this week for Westeros The Series, which shows what the world of Westeros may look like, if the series was set in present day. The video has already gone viral, with more than 160,000 views in just a few days, which also has fans wondering if this will be an actual web series or not. The trailer was posted by Westeros The Series YouTube, which sadly doesn't present any further information, except for a brief tagline, "The more things change. The more they stay the same" and a mention that this is a "Game of Thrones spin-off," although it is by no means an official one. While HBO has announce that there are five spin-offs in development, it has been confirmed that they are all prequels, set long before the events of the George R.R. Martin books and the hit TV series it's based on. So while this trailer is certainly a fan effort, whether or not an actual full series comes to fruition, reportedly in the year 2019, remains to be seen. The trailer doesn't feature any actual stars of the show, which makes sense since, if this show were to become a real thing, would be set decades, or even centuries, after the original series. However, the trailer does feature some iconic imagery from the show, such as the massive Titan of Braavos statue that guards the entrance to this important city, although now, the head and sword-wielding arm of this statue is gone, leaving just the torso and legs behind, flanked by rows of modern wind turbines that are almost as massive as this statue, and behind the statue lies a modern metropolis full of skyscrapers. There is also a very brief shot of the iconic Iron Throne, which is now a remnant from a forgotten time, sealed behind a glass case. There is also a rather creepy shot of an unnamed character who wakes up from his slumber, as we can see his eyes are blue, just like the Night King and his white walker army, as we can also see some dried blood on the bed he sleeps on. We also learn that some of these family names still live on in modern day, as we get a brief glimpse at a sign for Targaryen Square, while the man seen giving a big speech earlier in the trailer is revealed as "Prime Minister Lannister," with a flag bearing the Lannister sigil behind him, as he addresses rumors of dangers beyond The Wall, telling the masses that there is "nothing to fear", while we see a shot of a woman in white getting out of a car, with what appears to be a direwolf behind her, hinting that she is a Stark, which is followed by a group holding up a House Stark flag with the wolf sigil, as an unnamed character states that the "long night is coming, and the dead will come with it." The trailer ends with a shot of Prime Minister Lannister assuring the masses that there is "nothing behind The Wall," which is naturally the same belief practically everyone in Westeros had throughout the season, until the Season 7 finale, when Jon Snow (Kit Harington), Tyrion Lannister (Peter Dinklage) and Daenerys Targaryen (Emilia Clarke) brought proof the white walkers do exist to Queen Cersei (Lena Headey). The trailer ends with a shot of the shadow of a massive dragon flying over a city, showing that even the dragons have survived this long. As for who is actually responsible for this trailer, a report from The Telegraph claims that this may be the work of German satirist Jan Bohmermann, who tweeted out the video shortly after it surfaced on YouTube, and has a history of making topical spoof videos, including one from 2015 that was a parody of the 2005 movie V for Vendetta, entitled V for Varoufakis, featuring a fake clip of Greek finance minister Yanis Varoufakis giving the middle finger, which was so convincing that it caused quite the controversy before it was revealed to be fake. 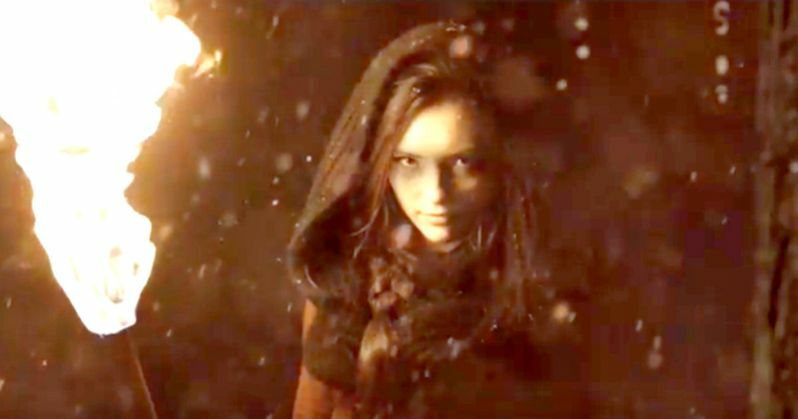 If this Game of Thrones fan trailer is the work of Jan Bohmermann, then it seems that Westeros: The Series may not be a real thing, which may come as a disappointment to fans of this video. Take a look at the fan trailer for Westeros: The Series below.